I alert my handler to problems before she feels it. I help her to walk when her gait is unsteady. I help her to get up from a chair when needed. I can pull a wheelchair if she needs to use one. I can sense when she is close to having a panic attack and I can help her get through it. Join us for the #SundayServiceDog blog hop. 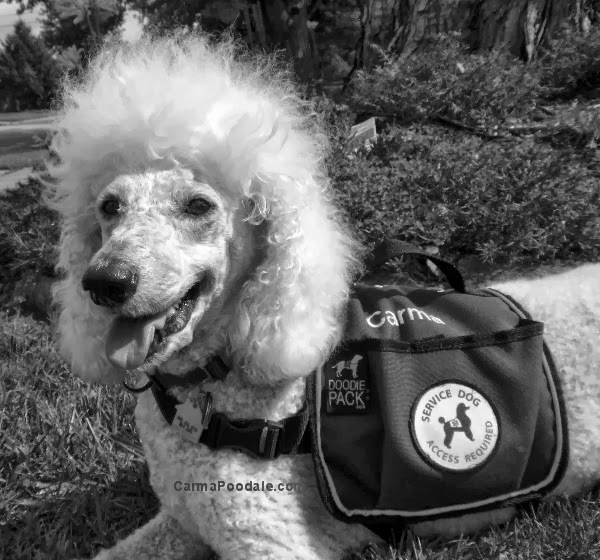 Garth's mom wrote a post to try to help people understand the differences -- Service Dogs, Therapy Dogs, & Emotional Support Animals - Important Differences. Please join us for the blog hop, by posting, linking your post, and/or visiting and sharing the posts. You don't have to be a service dog, therapy dog, or emotional support animal to participate -- everyone is welcome to join us in sharing information. You are a good dog Carma! Such a wonderful picture. What a big smile! Awesome picture of an awesome girl!